iPhone 6 and iPhone 6 Plus were recently introduced and soon will be offered in stores. Now when all detailed specifications of these two extremely expensive smartphones are available we can clearly point out couple of reasons why you shouldn't spend your money on any of these two. Prices of over $600 and £540.00 in UK are way over what you should spend on a smartphone. There are plenty of smartphones out there that can offer you similar functionality but at a much lower price. It is really not worth it spending so much money on a phone, especially nowadays when hi-tech gadgets became so much more affordable and you don't need to spend a lot to buy something really nice like a high-end tablet. 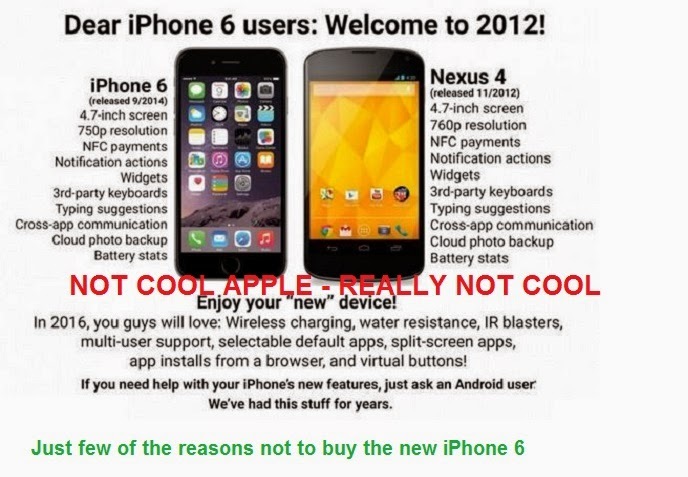 You've probably seen this image called 'Dear iPhone users: Welcome to 2012' where all the 'new' features in the iPhone 6 were already existing in the 2012 Nexus 4 smartphone - NFC payments, notification actions etc. We quite agree with this statement as the iPhone 6 and iPhone 6 Plus are missing some crucial new features like wireless charging, IR blasters, water resistance and many others that are already implemented in flagship Android phones like the Samsung Galaxy S5. As a conclusion I can clearly state that the iPhone 6 is far from innovative and that is a big reason not to buy this phone. iPhone 6 and iPhone 6 Plus - the end of the iPhone era?